Near the old Cotswold market town of Stow on the Wold, hidden at the end of a private drive are two cosy self catering holiday cottages with far reaching and uninterrupted panoramic views. Set in a secluded, peaceful location on a small working farm, they have been converted from an original Cotswold stone barn. The open beams and exposed timbers retain rural character and charm, providing a sense of farming history. The accommodation has a private flower and lawned garden with seating, picnic tables and barbeque, ideal for summer breaks. Blackpitt is also charming in winter. Something we recommend is getting up early on a frosty morning when everything is still and quiet, when the roads are empty and the birds are singing in the hedgerows. As you tramp along the crispy ground you can see your breath in the cold air, it is these moments that capture the precious secrets of the Gloucestershire countryside. 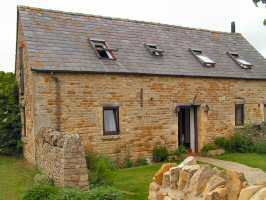 The cottages are fully equipped with all essential appliances, bed linen and tea towels. 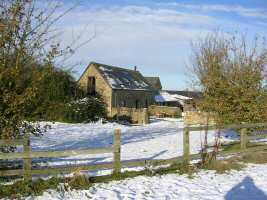 Both cottages have Broadband access and the hot water is heated by solar-power. ( with boiler back up for those not so sunny days!) We always welcome dogs, especially well behaved ones. The washing machine and tumble dryer, both coin operated are in the tack room next to the cottages. There is a freezer in the tack room which guests are welcome to use. Recycling is encouraged as much as possible especially as we do not have a regular rubbish collection. We have a bottle and tin collection bin, a newspaper and cardboard bin and a compost bin for vegetable matter. We have ducks for bread recycling and horses for carrots, apples and polo mint recycling. There is a large bin for any other rubbish behind the cottages. The cottages share a private enclosed garden with garden seats and picnic tables. 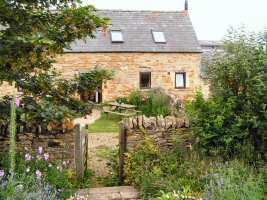 There are expansive large grass areas and wonderful footpaths surrounding the cottages, ideal for dog walking. Maps are provided in each cottage. One car parking space is allocated per cottage and please ask if you would like extra space. There is also undercover storage for mountain bikes, muddy walking boots etc. The cottages will be available from 4.00 pm on arrival day and should be vacated by 10.00 am at the end of your stay. We hope you enjoy your stay. Blackpitt Farm is one mile outside the picturesque village of Oddington, with its famous Michelin award winning pub The Fox Inn and two miles from the beautiful hilltop town of Stow on the Wold. It is surrounded by miles of footpaths and bridle roads suitable for mountain bikes, and is an ideal base for exploring the Cotswolds; England and Wales’s largest Area of Outstanding Natural Beauty. Michelin award winning pub, with excellent food and a fantastic wine list. More of a restaurant than a pub, to dine in as opposed to go for a pint. It is possible to eat outside in the Summer. Takes food orders until 10 p.m. This lovely pub in the centre of the picturesque village of Broadwell is within walking distance from the house. As the crow flies the route is shorter on foot than by the road. Dogs are allowed in on a lead. Walk your dog to the pub – perfect! Simple and simple good English food. Laid back, friendly local pub. Many a lively evening. Real ale. Takes food orders until 9 p.m.
A good fish menu. There are no telephone bookings, so try and arrive promptly to ensure a table upstairs. Wine is picked off wine racks, not a wine list. Takes food orders until 9.30 p.m.
Large garden. Good food at the higher end of the price range. Real ales. Moreton-in-Marsh famous for its Tuesday market. The Slaughters; two of the most beautiful and famous villages in the Cotswolds. Within 10 miles you have the pretty towns of Burford, with its Wildlife Park and Gardens, Chipping Campden and Broadway in Worcestershire. Climb up Broadway Tower to have a look at the exceptional view covering thirteen counties. Birdland, Bourton-on-the-Water. Snowshill Manor containing Charles Paget Wade’s extraordinary collection of craftsmanship and design, including musical instruments, clocks, toys, bicycles, weavers’ and spinners’ tools and Japanese armour. There is a delightful organic garden, and Mr Wade’s cottage can also be visited. The Lavender Fields nearby are worth seeing. Stanway House, with one of the finest water gardens in England, which now has the tallest gravity feed fountain in the world. Within 25 miles you can visit Stratford upon Avon, Warwickshire, home of William Shakespeare and the Royal Shakespeare Theatre and Warwick Castle, Cheltenham, the home of National Hunt racing and in Oxfordshire, Blenheim Palace and the University City of Oxford.